“Fat-Biking” started out as a fad, and a lot of cyclists radicalized the ones that they used for a long time, but nowadays fat bikes have become a staple of the sport. They even have a Global Fat Bike Day, not bad for a fad. A Fat bike is nothing more than a mountain bike made with a much thicker frame and big wheels, usually 3.8 inches or even larger. They were invented in Alaska where people wanted to ride the bikes over the soft snow, but for the last few years, they have been spreading all around the country. Whether you are an expert cyclist with years of experience or a beginner who is thinking about buying his first bike, you should really consider getting a Fat bike. Don’t believe me? Keep reading for five reasons why you should own one of these bad boys. Of course, there are places around the world where cyclists can ride their bikes all year long. But if you are an experienced biker then it’s likely that you know the pain that comes with putting your bike away for the winter, and there are places where this season can last as long as six months! It was in a place like this where Fat Bikes were invented, and getting one can be the key to a mountain biking season that never ends! Different people have different reasons to get into mountain biking. But the reason for most people to fall in love with the sport is that it’s damn fun. Enjoying the ride. the views and the feeling of being in contact with nature are what keeps most people riding for their entire lives, and sometimes small bikes make us forget that. You become obsessed with speed and loop timing and forget that you are supposed to have fun while riding. A Fat Bike, while not as fast, is perfect to remind you how to relax and enjoy the ride. You may think that is not worth it to get a fat bike just for the chance to ride on snow, but the truth is that a Fat bike is a lot more than just that. Ever thought about riding on the soft sands of a shifting dune? Wondered what it would be like to traverse any kind of shoreline? 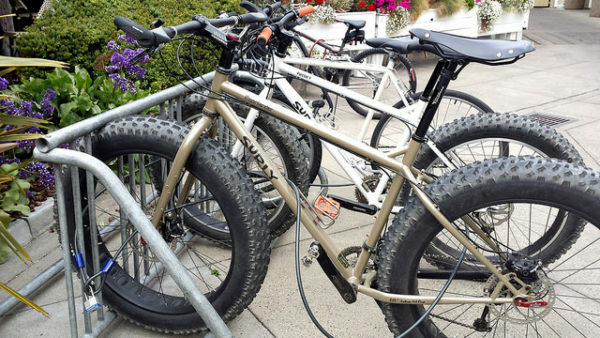 Fat bikes are pretty much “All Terrain Bikes”, and you can take that literally. They will take you anywhere you wish and you will never have to worry about damaging your bike while riding over hard terrain. For the adventurer inside you, it will be a dream come true. Even if you are not the adventurous type, you can use your fat bike to ride around town with ease, asphalt, dirt, curbs, sidewalks, it doesn’t matter! A Fat Bike can handle everything, and it will even help you save on gas, talking about efficiency. Even if you are just starting out in the mountain biking world, you probably hate, or even fear, rocks already. 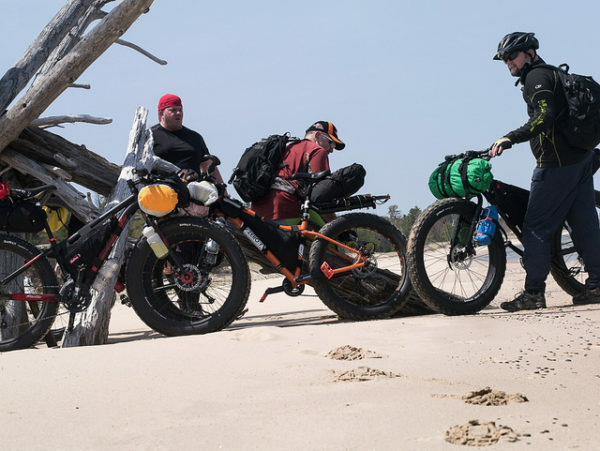 They pose a real danger to any biker, especially those who are just starting out and getting a Fat Bike can help you forget about them completely. A suspension equipped Fat Bike does an amazing job when it comes to rocky terrain. These bikes shred through gnarl like it is nothing, especially if you have a hard tail bike. Other bikers will probably think you are cheating, but the secret is in your big fat tires. If you are a Mountain Biker then there is no point in trying to deny this single fact: You love buying new bikes. Every single cyclist drools over the new models that come out every year, and most of them would buy a new bike every month if they could. But sometimes, it is hard to give your couple, family, or even yourself good reasons that justify getting a new bike. But with Fat Bikes, you have a great reason to buy one, in fact, several reasons. It’s a bike you can ride all year long. It’s harder for these bikes to break or get damaged on the road, which means less money on maintenance. You can use this bike to ride to work or other daily activities. So if you have the cash lying around, don’t fret over it and buy a Fat Bike. I can assure you won’t regret it later, especially when you first go out during the winter and enjoy the view of a snowy mountain after a ride.